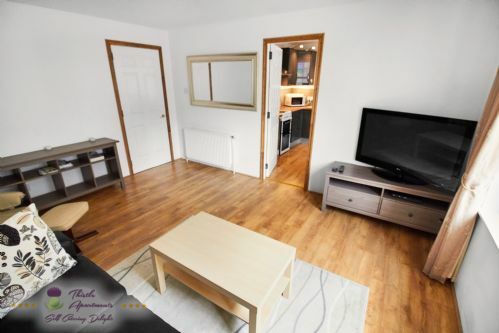 This beautifully furnished ground floor apartment is located in heart of Aberdeen within secure apartment complex. Location is quiet and each apartment has it’s own allocated parking space. This 2 bedroom property is located within 2 minutes walk to main high street and surrounded by places of interest, restaurants and shopping centres. Marischal Square Superior Apartment features well equipped dining kitchen, hard wood oak flooring in the kitchen and the lounge. 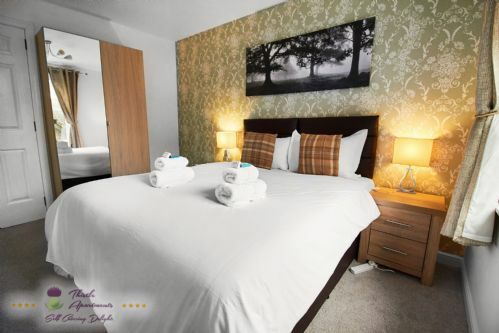 Spacious bedrooms offer comfort with each room fitted with TV & DVD player. I booked this apartment for some employees working in Aberdeen. The customer service from Lucas was great, he was always lovely to talk to and handled my bookings very quickly. The apartment was great value for money. Really enjoyed our first stay in Aberdeen. The apartment could not have been any better. We found the apartment clean and very welcoming, better than staying in a city centre hotel. The apartment was ideally situated, central to all the best that the city has to offer. Stayed for two nights and it was excellent. We were met on arrival and the location is perfect for exploring the city. My son calls this our new new home. 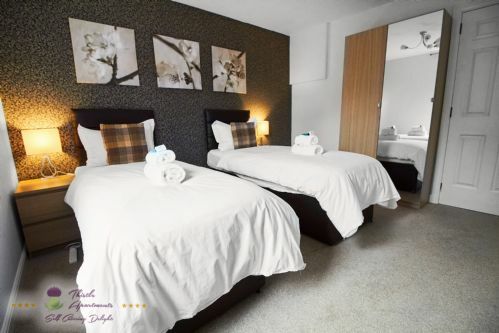 It has everything you need and more for a very comfortable stay. It is located very centrally and we look forward to coming back. 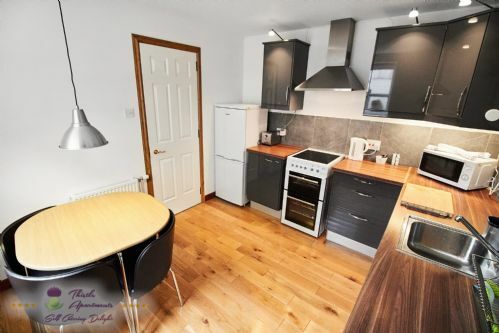 Very nice, will located flat in Aberdeen. Lucas was very responsive and accommodating. The flat is in a great location and includes parking! The flat was very tidy and comfortable. We had a lovely stay in Berry Apartment. The sofa and the beds were a little firm for our tastes but it was great to have a bath and the kitchen was fairly well appointed. The handbook was very useful for local amenities and the secure car park was a very welcome addition. This is a lovely apartment. Very central, very clean and has everything you could need for a trip away from home. The host was extremely accommodating with everything and we couldn't have been happier with our stay there. We will definitely be back and will be recommending to others visiting Aberdeen. Excellent communication and we really appreciated the free service from and to the airport! The flat was very clean and comfortable. Amazing shower and good appliances in the kitchen. Very close to centre and shops. 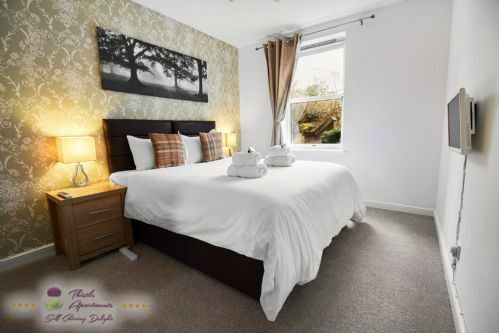 We thoroughly enjoyed our stay, the apartment was perfect in every way - clean, comfortable, good central location, private parking and nice and quiet. Our second visit to this apartment , location is good, private off street car park so no worries about parking meters etc. Meet and greet always prompt on time to allow access through the barrier. I have no doubt that we will be back. We enjoyed our stay. The apartment was very clean and tidy. We received excellent customer service. We would stay again. Apartment was very clean and I was met personally by Thistle for my check-in. Very nice touch! 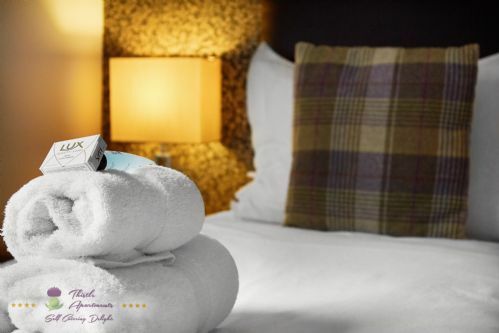 Perfect for staying some days in Aberdeen! In general everything was OK and the situation and facilities for parking were excellent. However the stuff for cooking (cassroles and pans) were pretty old. Fine size apartment in city centre location. Beds poor with two singles joined together to form a "large king size". Toilet seat and bath extremely flimsy! 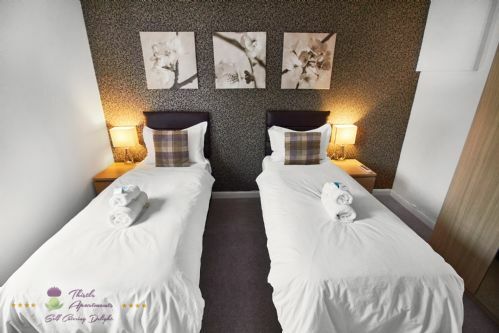 We had a pleasant stay at Berry Appartment, we checkin and checkout were fast and the appartment nice and clean - we would book again, when in Aberdeen. Stayed for one night with girlfriend and two children. Great central location right outside John Lewis. Private parking was a great bonus. We were contacted as soon as the property was available which was great. Will definitely stay again. This is a very clean en comfortable appartment, but with its minimum decoration it has no atmosphere. The location is exellent. Host very friendly. If you love coolking, the kitchen is minimally supplied with tools en cuttlery, however we managed. A nice apartment where it was all you needed. Short distance to shops and restaurants. Nothing especially to say. Everything was OK. We were two couples and we enjoyed our stay. Private parking was OK. We came earlier than expected, and the owner came shortly after our call. All we missed, was a coffe maker. The apartment is spacious and well kitted out. It's great for a group weekend away and gives you a great space to hang out in between activities. The apartment is in a very good location, directly in the city centre. It is very comfortable and the area in which it is located is very quiet also during night. It provides already with pots, pans, dishes and everything one needs in the kitchen. The only disadvantage is that the beds are not very comfortable and the duvets not warm enough for the night. In general a very good apartment that I would strongly recommend. It is the most comfortable choice to go with. Fast response, good cleaning, fast interaction, nice location to city center, good furniture. 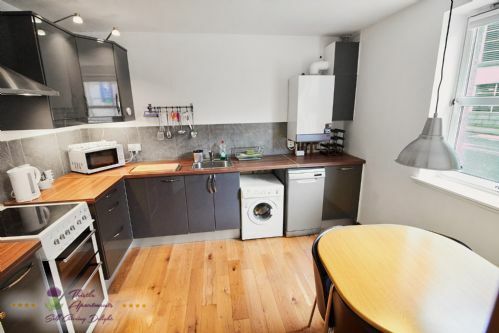 Can't fault this fantastic appartment in the heart of the city. Clean, modern & practical. Great correspondence in regards to our needs for room set up, check in/out etc. A very useful guest information booklet with everything we needed to know about the appartment, contact numbers and also recommendations for restaurants/take aways in the area. They also arranged taxis for us. Nothing was any trouble, especially when I left items on the room. They kindly posted them back to me . We all do appreciate good service. Everything clean and each room has it's own TV. Modern apartment 2 minutes walk from Union Street. 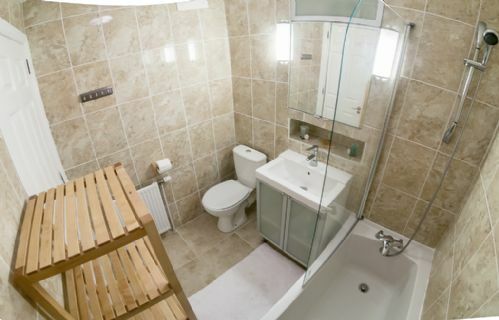 Very high specification throughout. Private and secure parking is a great bonus. I will be coming back soon. We have since had a good time. in the center of Aberdeen. would love to come back soon. It was clean and tidy. We were happy with the parking. Good value for money! Ideal for shopping weekend away! Pros: Brilliant location with free secure parking. Excellent value for money. Comfortable beds and decent couch in the living room. Kitchen has everything you might need, a variety of utensils and appliances. Friendly and professional staff that meet you at the apartment on your arrival. Cons: only one pillow per person provided. No bath mat. The provided travel cot didn't have a mattress. Overall great accommodation and would recommend to others. Such a great weekend! Between the four of us it was amazing value and such a great place, in walking distance of everything! Even if you don't know Aberdeen it's super easy! Couldn't fault it one bit! We had a short 2 night stay for a family occasion. The appartment was perfectly located for shopping and public transport and had secure parking to the rear of the property. It was beautifully furnished and perfect for us and the children. Highly recommended! Will most definitely be using the berry appartment again in future. Single bed it is a litle too small for 1 adult. The heaters didn't work until a technician came by and changed something, although I had an electric heater provided by the owner. We are really satisfied with the apartment. The location, customer service, cleanliness and well equipped apartment made our stay a memorable one. Overall a nice apartment in a good location. Great to be able to catch up on washing and cook our own meals after a week of travelling. We were a party of 3 adults and my fellow travellers found the twin beds very narrow and uncomfortable, would be better with King singles rather than standard singles .Very good fast Internet . Very nice appartment with lots of space, big kitchen and two big bedrooms. Clean, modern and very good service. 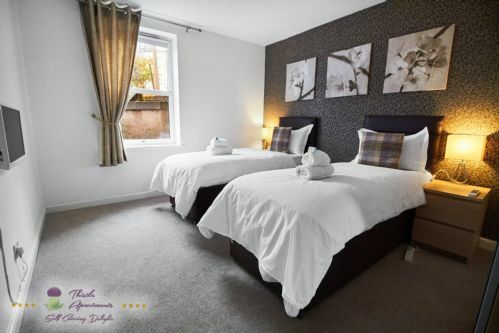 Nearby Aberdeens center, shops and a free private parking for your car. Excellent location, very comfortable and spacious apartment. All amenities available with fully equipped kitchen. Easy walking to shopping and train station. This apartment is excellent value for money, it's all been modernised it's like being home from home with all the comforts. Lucas cannot do enough for you, he collected us from the airport free of charge which we wasn't expecting, he was able to accommodate us with a late check out nothing is too much trouble. This apartment is in the centre of Aberdeen and is an excellent base for travelling around Scotland, would recommend these to anyone. We thoroughly enjoyed our stay here. We were totally satisfied. Great spot and had everything we needed. Very handy to town and parking provided was a plus. Very cosay and comfortable flat with everything which you can need. The kitchen is very well equiped and and the WIFI is very good. The only small bad point is that you have to call in order to find the good flat, but the person in charge came within 2 minutes ! We stayed in this apartment last year, we arrived late Wednesday but was greeted by Lucas with our key,monthlong was too much trouble, the apartment is spotless, and has been updated from last year which made our stay even more amazing, perfect location in the centre of Aberdeen, ideal for traveling around. The apartment is good, has all the amenities you need and a designated parking. I stayed there with hub and young daughter, everybody was happy. Bedrooms are good and have TVs. Host was super helpful and friendly. We managed flexibility on the check in and check out times, what was extremely handy. The biggest highlight is the location right in the city center. Walking distance to bars, restaurants and shops. That was what we were looking for and we were very happy with it. Fantastic location. Apartment was spacious and well presented. Staff were friendly and helpful. It was one of the more pleasant trips I've had recently. We would highly recommend this apartment for its central location, comfort and cleanliness. Although only a short walk from the city centre there's no worry about parking as the apartment has a secure, dedicated parking space. There are very comfortable beds and feather pillows and quilts with quality, pure cotton linen...heaven. All fittings and fixtures are of good quality and Lucas greeted us at the apartment and was at the end of the phone if we needed him. The kitchen is well equipped--doesn't provide seasoning though. The shower is strong and the temperature of hot water is very stable. Great location--2 minute walk to supermarket, 5 minute walk to city centre and 12 minute walk to train station. I'd stay here again in a heartbeat. I can't believe how lucky I was to get this apartment. The apartment is in an excellent location just minutes from union street and also has secured free parking too (which was surprising being so close to the centre). The staff was very friendly, helpful and professional. The apartment was clean and modern with everything you expect from serviced apartments with all the mod cons. 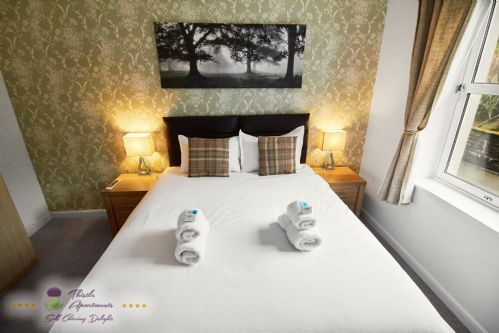 The bedrooms were spacious and having recently been renovated with new fixtures and fittings it was to a high standard with very comfortable beds, TV/DVD players in each room, which would be handy for anyone travelling with children. Have stayed at these apartments before and was impressed, and I was not let down again. Good value, has everything required within the apartment, I would definitely book again. Excellent apartment, warm, homely, clean, tidy. 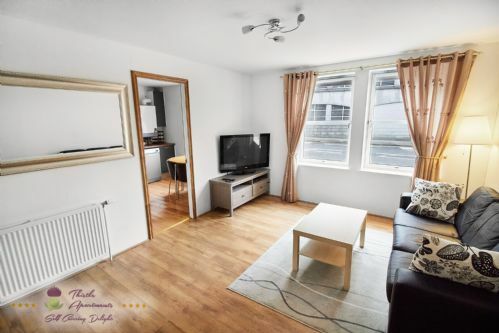 Fantastic location in the centre of Aberdeen close to the main Street with all the shops, cinema, restaurants, bars, clubs, train station, bus station and harbour. We stayed here with my family over Christmas and everything was set up when we got there. The apartment was clean and also spacious.They even provided a high chair for the baby. When we noticed checkout was at 10am we asked if we could maybe check out later and they were very accommodating. Overall great value for money and great customer service. This was a great location. Walking distance to all the local sites. Very comfortable and clean. Only recommendation would be one more chair in living area, the fourth person ended up sitting on the floor. Hade 4 sängar, de var lite smala! Fint läge, centralt med hemma-standard på lägenheten. Servicen var fantastisk. Rent, snyggt och trevligt. Inget larm från gatan, sovrum mot gården. Perfect for using as a Base to explore Aberdeen. Quiet, very close to the shopping centres. Walking distance to railway station, parking for one car. I would book this again. As I have family in Shetland, this was a good halfway meet-point. Great location, the two bedrooms apartment was really good size and we had everything we needed. Just some minor maintenance issue, like the towel hanger in the rest room. would definitely recommend. My wife and I, along with our daughter and her husband and son, stayed for 1 week in this apartment in Berry Street, Aberdeen at the end of July 2015. The apartment was perfect for our needs. It was clean and tidy with 2 generously sized double bedrooms, bathroom, large living room and kitchen with all necessary kitchen equipment. We had a dedicated car parking space close to the apartment and an electronic key for entry to the car park. Lucas supplied a travel cot and high chair for our grandson and kindly offered my daughter's family a taxi ride from the airport. The best thing about the apartment was its proximity to the centre of Aberdeen. There is a Co-op store, that is open late in the evening, nearby and a large shopping centre across the street and Union Street (Aberdeen's high street) is less than 5 minutes away on foot. Around the corner we found a pub that hosts the Aberdeen Folk Club on Wednesday nights and a jazz club on Thursdays - well worth a visit. A TV, DVD player and good Wi-Fi added to the experience. I can recommend this apartment to anyone planning a trip to the Granite City. The apartment was ideal for our needs and very central. It is well equipped, comfortable and modern. It was spotlessly clean and decorated to a high standard. Lucas was very helpful and we were able to phone him if we had any queries or problems. I would recommend it to anyone wishing accommodation near the city centre. Large apartment. A bit difficult to find, because the house number was not given, only flat B in the e-mail with confirmation of the arrival time. Clean-up could have been better. But large rooms and enough space for all our stuff. Parking space was available and easily found. shops are close by and easy to find. Some information leaflets from the tourist info are available in the room. Our 2 night stay at Thistle Apartments was great. The flat was very clean and comfortable and the location couldn't have been better. There wasn't much of a view since the flat is at ground level across from a parking garage, but the convenient access to the city center more than made up for that. I would happily recommend the flat to anyone wishing to explore Aberdeen, especially if you are driving (free parking is included with the flat). We spent 2 nights in this apartment as part of a 2 week road trip and the position was perfect right next to John Lewis with parking included. Great stay. Family stop over in Aberdeen. Positives: location, prompt service to gain keys, prior communication & layout of apartment. Negatives: not well cleaned, bin not emptied, no toilet brush, street noise & external door slamming. While I would recommend, I would also temper this with value for money - I stayed in similar locations, in similar apartments for much less - maybe it's just Aberdeen. Stay at the Thistle apartments in Berry Street. The accomodation comfortably met our needs. Central, well fitted out, and a nice touch from the owner to ask how we wanted the beds split. We booked these apartments on line, they were in the centre of Aberdeen, ideal location for visiting the surrounding villages. Wil be using them again. My friend and I stayed for a few days and picked this appartment for it's central location - which was perfect. Lucas was very helpful and friendly. Living room was simple but comfortable, but the beds were amazing. I slept like a baby. Bonus points for customer service (appartment was clean, with freshly made beds and towels) and private parking right next to the appartment. Everthing was really good, the only little not so nice thing:- looking outside is not so beautiful because of to be close to the street. The appartment was very clean and has very nice equipment. It is an advantage to have a parking place close to the the apartment and you can go by feet to the town centre. I am happy to stay in the apartment. A good solution for anyone who wants to stay in the city center, good communication, shopping, and entertainment. Apartment comfortable and well appointed. The service friendly and professional. We spent 2 nights and we found the apartment was very pleasant. Very well located. Beds were very comfortable. Sure to come here again if we need somewhere to sleep in Aberdeen.Thanks a lot. The place was clean and comfortable. Someone was there to greet us as we arrived which was helpful. Month old baby was sleeping, but had we been there without him it probably wouldn't have bothered us. I loved my stay perfect location and was made to feel comfortable and they went out their way to help me with a few hiccups I had left my bag in the appartment and the gentleman picked it up and delivered it to me and our flight was late arriving and they were accomodating with the situation and we had to arrive early and they were brilliant with me. brilliant service and will be booking again I hope. The apartment was very central. Comfortable and clean. The service on arrival was excellent. The facilities were excellent everything we needed to make it a home from home, very good atmosphere in the apartment, felt at home straight away. The shops just accross the road was an added bonus. Only drawback was the Kitchen although well equipped the cooker could do with an update. (but only if you cook at lot). Convenient for a short stay, however, being located at a busy junction and at ground level, very noisy. Also, had to keep all blinds shut for any privacy. Residents in block noisy too. Well equipped kitchen, good facilities. All doors very squeaky, fan in bathroom very loud too.. Spacious enough for 3 people, however the lounge would benefit from an additional chair if 4 people were staying. Heating system very good, we were very cozy. Allocated parking was a big bonus, especially with apartment being located in the middle of a busy shopping area. One problem with a mattress, it sloped down at one side. I found myself rolling into the middle of the bed all night long! A shame because the bed was generally quite comfortable. All in all was pleased with the accommodation, however due to traffic and pedestrian noise, we would not stay again if other apartments were available. 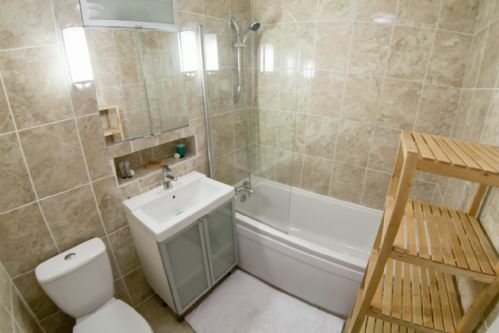 - Very good location, directly access to city centre. Very nice location, private parking directly behind apartment, only negative is that apartment is on the ground floor directly to the sidewalk, so curtains has to be closed if you want a little privacy - but nothing unusual in a city apartment.